Our series of Viking Profiles aims to shed some light on the some of the lesser-known roles in the gaming industry. 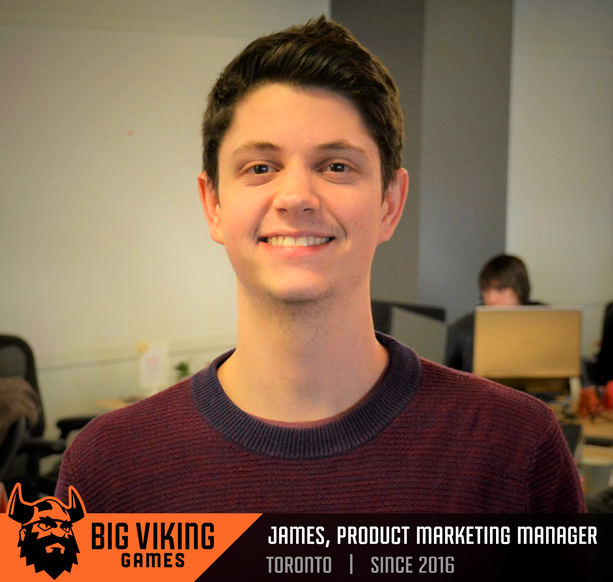 Today we’re talking with Viking James to learn more about what it’s like to be a Product Marketing Manager at Big Viking Games. What is your role at Big Viking Games, and how long have you been with the company? James: I’ve been with Big Viking Games for over two years as a Product Marketing Manager for two of our titles YoWorld and Fish World. What does a Product Marketing Manager do at a games company? James: I work with the rest of the team to promote new features, events, and content that gets released into the game. We also work on the monetization aspects of our games, how to get new and lapsed players playing, and we analyze the team’s decisions to see what worked and what could be improved next time. It’s not all business though. We also do loads of fun things like put together email newsletters for our players, make trailers for exciting new features, produce fun social media content on Facebook, and conduct player feedback surveys which help us determine what our players like as well as what they want to see next. What does an average day look like for you as a Product Marketing Manager? James: The first thing I do is look at revenues from the previous day. I look at what went well and what could be improved. The rest of my day is dedicated to a variety of things such as planning for future releases and marketing campaigns, implementing these plans, or doing analysis on past marketing efforts. How did you become a Product Marketing Manager? James: I went to university for business specializing in marketing. After completing the program, I started out my career as a Product Marketing Analyst at another games company called Magmic. There, I worked on mobile games like New York Times Crossword, Rubik’s Cube, Scattergories, and Apples to Apples. After a year or so I owned the marketing strategy for all of Magmic’s Mattel branded mobile games as their Product Marketing Manager. How has your career progressed at Big Viking Games? James: I started at Big Viking Games as a (lonely) team of one. Over time and as responsibilities increased, I was able to grow the team and we have since added six fantastic members across the Marketing and Content Marketing Teams.